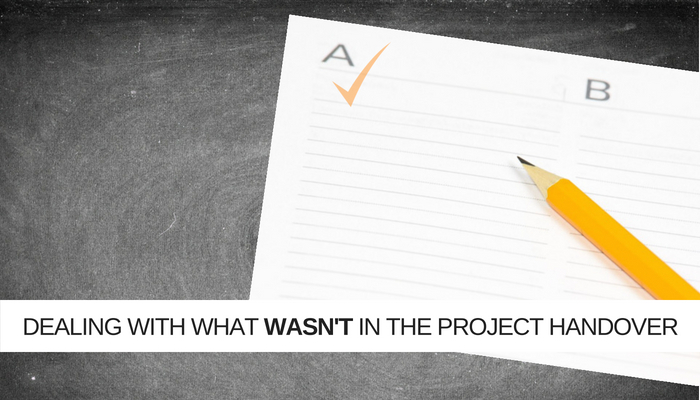 Have you ever taken on an IT Project, only to find that a major challenge either wasn’t mentioned in the handover from the departing Project Manager or, if it was, it was implicit – not explicit. It’s like those horror movies where a family buys a house only to find out, after they move in, that it was built on an ancient burial ground and comes with its own poltergeist. As the IT market becomes increasingly talent led, it is inevitable that more project managers will move on to pastures new. More and more projects will be completed by a different manager to the one who took the brief and set it in motion. Handovers, therefore, have to be spot on and, often they are not. You can almost forgive the outgoing PM for this. Who wants to put their name to a document that declares, as they leave, that their legacy is a project that is out of control? I once took on a project that was “a tad over budget”. Those were the exact words in the handover notes! What “a tad over budget” actually meant was that costs had crept so far from the initial forecast that absorbing them would mean drastic re-alignment, there were no contingency funds, so savings would have to be made by reassessing resources on this project and across the portfolio but, worst of all, everyone had their head in the sand and denied there was a problem – as you can imagine, I was “a tad” cross”. Over the years I’ve heard this story repeated, in one form or another, time and again. If it’s not “engaged stakeholders” who actually turn out to be interfering, then its “proactive team members” who turn out to be loose cannons. Project Manager handover notes can sometimes be a little like estate agents descriptions of properties where cramped becomes ‘compact’ and ‘double bedroom’ describes a room just large enough for the smallest double bed. Over the years I have developed two strategies for overcoming challenges that weren’t ‘advertised in the brochure’. A) Enter Each Project Through the Ground Floor (Not the Penthouse). B) Have A Plan for Everything. As demonstrated by the “in my opinion” project manager described above, handovers run the risk of being subjective. As I say, you can almost forgive the outgoing PM for this, so expect a little “embellishment” of the reality. Make your own judgement based on the landscape you inherit not the map of the terrain that you are given. That’s what I mean by entering on the ground floor. You need to start your time on your new project with an honest appraisal of where the project is at. Consider the example further, if you were to take the outgoing Project Manager at his word and accept, as fact, that a number of key deliverables were about to complete, you might start planning from there. This would be entering at the penthouse – which is all well and good as long as the foundations below you are solid. In this case, you would have soon discovered that reality was running a little behind aspiration and so the plans you made were not built on robust foundations, in which event, the penthouse is a pretty precarious place to be. Entering from the ground floor, checking the foundations, shoring up work that has been completed and measuring each stage of the project against your high standards, not someone else’s, although initially time-consuming, is worth it in the long term. Plus, it gives you ownership and a chance for the project team to start with a clean sheet and make good any corners that were cut or mistakes that were made – interview them, run over the handover, canvass their viewpoint. You’re not starting from scratch, but you can quickly stamp your mark on a project by doing this. This works whether you are taking on an existing project, starting a brand new one or, when you are parachuted in to rescue a struggling project. Back in my early days of Project Management, this meant copious note taking, making sure that I learned and remembered lessons from previous projects and a cultivating a trusted squad of contacts I could call on to help from my address book. Having a plan for everything meant drawing upon my experience and it served me well for many years. But it was also limited. I hadn’t experienced everything! Then, something game-changing happened. A universe of possibility opened up. You could draw upon the experience of others and a huge range of possibilities that hadn’t even happened yet. The project I mentioned earlier, that was “a tad over budget”, delivered on time and within cost. It was thanks to resources accessed from the PMaaS market and at a lower cost than the internal resources already allocated which could be redistributed across the portfolio and put to better use. These days there really is no excuse. There is always someone who will help, either after a Google search for projects that have faced and overcome the same challenges you are facing or by developing a great relationship with a PMaaS partner who will always have your back. Having a great PMaaS partner also gives you some protection from talent moving on. Having an independent third party “in the background” allows you to enjoy continuity by keeping the lights on during periods of staff transition. PMaaS solutions can be dialled up or down in line with demand and a great partner will get to know you and your projects as well as you do. However, you are coming at your next project, inheritance or initiation, entering through the ground floor and always, ALWAYS, having a plan, will see you right, regardless of what anyone “forgot” to tell you! Next Who needs a PMO?